If you're like the rest of the general populace, chances are that at some point in your voyage across streaming platforms, you've hit a snag and can't decide what to watch. For whatever reason, the content presented to you overwhelms you and you shut down, ending up rewatching The Office for the fortieth time through. Sounds familiar, right? Thanks to Netflix-Codes.com, a nifty website that's begun to make rounds online, you might have a new service to help you narrow down potential options instead of full genres being crammed straight down your gullet all at once. You see, in addition to assigning "general" categories to each property on the streaming service — say Comedy, Horror, Drama, Action-Adventure, etc. — Netflix also assigns each movie and television show into a subcategory that further breaks down the genre. If you're looking for a horror movie, Netflix has the properties sorted into subcategories like deep sea horror, zombie horror, teen screams, monster movies, horror comedy, and more. Now, the tricky part of this is — these subcategories are technically "secret," for lack of a better term. 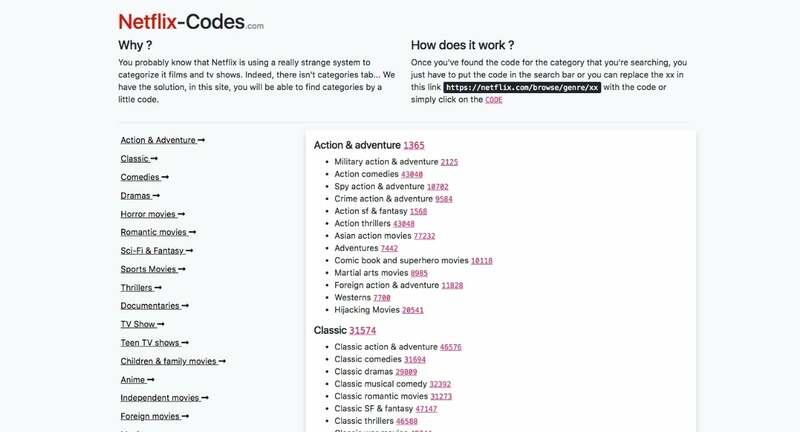 Each of the subcategories is assigned a "code," which Netflix-Codes.com then tracks. Since the subcategories are technically "secret," you'll have to follow the process listed on the site — which is virtually painless if you're watching Netflix on a computer or laptop. If you have to subcategory picked out you'd like to browse, you navigate your browser to //netflix.com/browse/genre/XXXXX, replacing the X's at the end with the respective code you pick out from Netflix-Codes. While the service should help you tremendously in picking out a flick to watch on movie night, it does have a pretty big downside. The URL only works with browser-based devices, meaning that it's really only available on computers and laptops. For those that watch Netflix on Roku, Amazon Fire, Apple TV, or other smart devices, you appear to be out of luck — for now. Were you aware of Netflix's secret subcategories? If it's news to you, is it a service you think you'd used repeatedly? Let us know your thoughts in the comments below!